September, if I hadn't lived you, I wouldn't have believed you were possible. And by that I mean to say that it's been a good month...an amazingly good month. You can trust me on this one. Linking up to Fresh Sewing Day. On the Sunny Side of the...Pouch? Have you ever had a morning when you needed to sew? I don't mean "needed" as in trying to meet a due date for something, but more like "if I don't get a chance to play with my sewing machine today, my soul is going to wither and die?" That may be overstating things a bit, I suppose, but not by much for me this morning. There are many amazingly wonderful things going on behind the scenes here at Fabric Mutt these days which I unfortunately can't share with you yet, but sadly they don't include lots of free sewing time. Today, though, I just had to sew something for the fun of it. Since I've been needing a new pouch for my traveling hexagons, I grabbed the mini charm pack of Sunnyside by Kate Spain that's been staring at me from the shelf for over a month and got to work. The pouch is lined with Fairy Tales in white from The Land That Never Was by Lisa Congdon for Cloud 9 Fabrics. I absolutely love the simplicity of this print, and the playful words are a nice compliment to the exterior. On another note, I'm embarrassed to say that I've had a Clover hera marker sitting among my tools all summer long, waiting ever so patiently to be used. After finally pulling it out for the first time today, I could kick myself for neglecting it for so long. It works like a dream. Am I happy with this little pouch? Let's just say that it's sitting next to me as I type this evening -- and the sunny side is up. I adore the color palette of this quilt. It's rustic and vibrant and so very fall. The giant log cabin block lets the prints shine, which is exactly what I wanted to do. For the backing, I used four glorious yards of colored dots from Erin Michael's lovely Lush Uptown collection for Moda. I can't get enough of this print -- it's beautiful. This quilt is for my dad, one of the nicest guys I've ever known. I love you, Dad. My little sewing school is still in progress with the girls this year. About every third week we do a project of some kind together, and our latest one was sewing zipper pouches. They had a blast picking out fabric for these, going through every last print in my stacks for just the right pieces. Mouse, who is currently obsessed with ducks, chose one of Lizzy House's first collections for the exterior of her pouch and an unknown yellow print for the lining. Bear was desperate to use those mixing bowls by Lori Holt on the outside of her pouch, adding a Briar Rose calico print for her lining. She faithfully uses that pouch to store her pencil every single day for school. Bunny fell in love with these dogs by Heather Ross as soon as she saw them and lined her pouch with one of the most popular prints in my stash as far as my girls are concerned: Mr. Bear by Sarah Jane. The girls had so much fun making these. While I sometimes find one left forgotten on the floor or table, heaven help the sister who touches a pouch that doesn't belong to her. Now I'm just trying to decide what to do for our next project. Any suggestions? At first glance, it looks as though I may be the most organized mom in the world. Could it be, you ask, that she's actually finished work on fall costumes right here in the middle of September? No, no, no. I should only wish to be such a supermom. Instead, these are the capes which I whipped up on a wing and a prayer during any spare minute I could grab over the weekend in preparation for tonight's big family event at our local Chick-Fil-A: Superhero Night. The girls found out about it last Thursday night, and how could I resist three sets of big blue eyes and those eight magic words: "Mommy, could you make something for us...please???" I loosely followed this tutorial from Craft Buds to make the capes. The suggested magnet fasteners from JoAnn Fabrics are a genius solution -- no velcro, no tying the edges, and they hold fast no matter how much the kids jump around. I used some felt to add an insignia with their initial to the back of each cape. The slippery polyester fabric wasn't my favorite to work with, but aside from that, this really was a pretty easy project. Keep it in mind if you need a last minute costume this year. 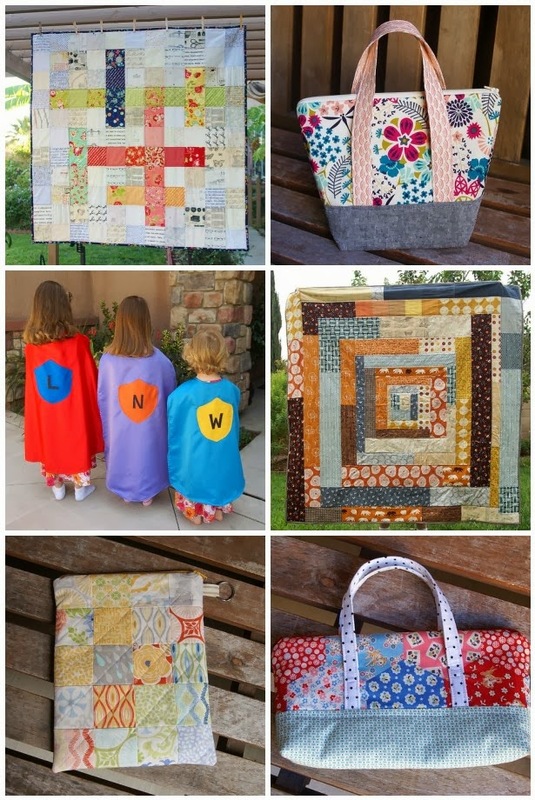 Linking up to Sew Cute Tuesday. As I've mentioned before, buying clothing is not always the easiest thing for me, but last February I had my first adventure in the alterations department and it's quickly becoming a habit I love. I can't tell you how freeing it is to know that I'm not limited by the pieces available at the store. No longer do I have to worry about mailing a piece of clothing back from an online shop if the fit isn't exactly right, and I don't have to panic if they're all out of my size in the first place. This was originally a dress on sale from Old Navy that was actually two sizes larger than I usually wear. A couple measurements, a little pinning and cutting, and a few minutes at my sewing machine were all I needed to end up with a very comfortable top. While I love the idea of clothes shopping, the reality is not always so pretty. This makes reality almost enjoyable. Almost. There are days when you need a quick finish. Right now I seem to be in the middle of so many big projects, and while I love each one of them, the endless stream of ongoing work can get a little slow. Today I just desperately wanted to sit down at my machine and make something from start to finish. Since Sunday is my Mouse's third birthday, it seemed like a great opportunity to sew up a little present for her. 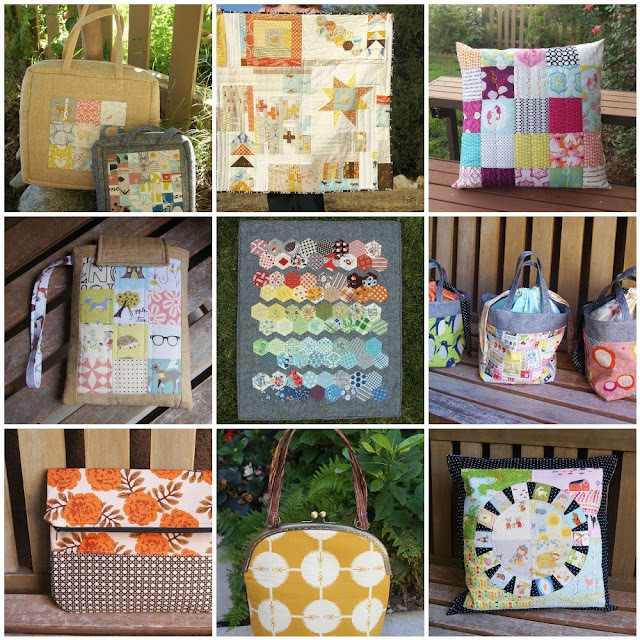 Enter Zakka Handmades. I bought this book back at the beginning of summer with great plans to use it immediately, but it just didn't happen. This afternoon when I spotted it on my bookshelf, I knew exactly what I wanted to make: the adorable Children's Pencil Bag. One thing that I absolutely love about patterns is seeing how far I can stretch them, especially when it comes to bags. I love to take a small bag and try it at a larger size or shrink a big tote down to a miniature version. It opens up so many possibilities, teaches me more about bag construction, and is just plain fun. So once I finished my first pouch for Mouse, I tweaked the measurements a bit and made a purse using fabrics from my Koi stash and some of my favorite Essex linen. I love the way this turned out. It's a good shape with lots of room inside. The linen adds nice texture, and even though the bag is larger, it's still a pretty quick finish. My husband took us out to our local Chick-Fil-A for dinner tonight. We go there about once a week, usually on their family craft night. It's led by a very sweet employee of theirs who has been so good to my girls, and we brought along this purse for her as a small way to say thank you. You should have just seen the smile on her face. Small finishes. Happy moments. This is why I love sewing, my friends. My name is Heidi, and I'm thrilled to be one of the bloggers participating in the Craft Book Month Blog Hop for Craft Buds. To those of you visiting for the first time, welcome! This is my happy little corner of the blogging world where I get to share my love of sewing and the adventures of raising three little girls in our Southern California home. If you come by here often, you'll see projects like the ones in the mosaic above. Please feel free to drop in any time! I can't ever remember a time in my life when I wasn't crazy about books. I grew up reading just about anything I could get my hands on: Nancy Drew, the Hardy Boys, the Boxcar Kids, historical biographies, the Chronicles of Narnia, everything that Beverly Cleary ever wrote. Honestly, things haven't changed much now that I'm an adult. Almost every room in our house has one or more bookshelves that are packed to brim with books of every genre, and over the past few years I've been adding as many sewing books to those shelves as I can. While there's a boatload of information available online, I just can't get away from the joy of holding a book in my two hands. The craft book that I chose to feature here is hot off the press: A Month of Sundays by Cheryl Arkison, who also happens to be the coauthor of Sunday Morning Quilts with Amanda Jean Nyberg. This refreshing book takes a unique look at sewing and how it fits into the rest of your life, particularly during everyday moments with family and friends. You'll find lots of great sewing projects in here, but you'll also discover tasty recipes, games to play with your kids, and tips for getting the most out of weekend shopping excursions. Each of the projects in this book also features low volume fabrics -- a very popular choice in the sewing world lately -- and Cheryl gives some wonderful ideas on how to select just the right prints for your chosen pattern. It was a tough choice, but in the end, I had to sew Cheryl's Crossword quilt. My mother loves to do crossword puzzles, word finds, and other brain teaser activities in her free time, and this quilt couldn't be more perfect for her. Since I was making a lap size quilt rather than a full size version, I changed the look of my puzzle from the one in the book, but the concept is the same. Instead of going with the grayscale prints in the original design, I decided to use colorful fabrics by Bonnie & Camille for the crossword squares -- choosing prints with both colors included any time two "words" intersected -- and low volume prints for all of the background squares in mostly black, white, and cream. For the back of the quilt, I pieced together large sections of colorful but simple prints from my stash. The quilt is bound in Blossom Festival from Tsuru by Rashida Coleman-Hale. This navy print puts the perfect frame around the piece, bringing all the colors together beautifully. I absolutely love the effect of this quilt. It's scrappy and comfortable and full of fun little details -- everything a quilt should be. Since I placed this quilt in my mother's arms, it's hardly left her lap for a moment. And isn't that exactly the future we want for all of our hand sewn gifts? And if you've finished a project from a craft book in 2013, you'll have a chance to link up your masterpiece too. Check out this post at Craft Buds for all the details, and be sure to visit Lindsey at LRstitched who's also sharing a project today! Thanks so much for stopping by for a visit. Happy sewing!